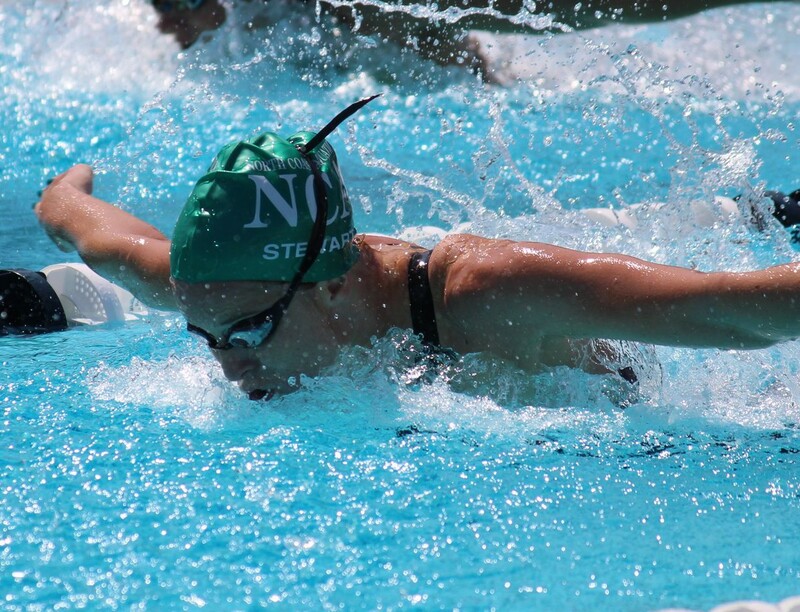 Kendyl Stewart became a breakout star on the American swimming scene when she claimed national titles in the 50 and 100 butterfly in the summer of 2014. It was a long time coming, as she was struggling to equal her best times for about five years prior. Needless to say, she made big waves; her victories earned her spots on the Pan Pacific Championship team later that summer and the World Championship team the following year, where she was a key component of the American world-record-breaking 4 x 100 meter mixed medley relay team. Kendyl was also elected captain at the University of Southern California and led the women’s swimming and diving team to a Pac 12 Championship title – the first ever for USC. She recently wrapped up an impressive NCAA career with the Trojans and is now training for Olympic Trials as a postgraduate. In just a few weeks she’ll race for the chance to represent the USA in Rio. I caught up with Kendyl to ask her about her training, how she takes ownership of her swimming, and how she handles the pressure of Olympic year. What’s your training like now that you’ve graduated? I’ve completed my NCAA eligibility, but I’m still training at USC under Dave Salo with the professional team. It’s actually mostly an international group with only a few USC post-graduates. We have a lot of countries represented at practice every day, with national team swimmers from Japan, Russia, New Zealand, Brazil, Canada, and the US, just to name a few. Dave’s style of coaching is non-traditional in that mostly everything we do is sprint oriented. Whether you’re a 10k open water swimmer or a 50 freestyle specialist, your practice will be detail oriented and pretty much two hours of fast swimming. I love it because you’ll never do the same workout twice. Dave is always coming up with crazy drills we’ve never tried before and new ways to keep practice fun – like pencil dives off the 3-meter spring boards or simply floating for a couple of minutes. How do you like training in a post-grad group compared to on a varsity team? Although I still have the same coach and generally the same training group, becoming a post-grad has given me a fresh take on the sport. It’s cool to have the potential to earn money now from doing something that I still truly love, and starting to think about potential sponsors and the brand or image that I want to create for myself is pretty interesting. But most importantly, I’ve found that it’s strangely motivating to have no obligations to anyone other than myself. I loved every second of my time representing USC, but the self-motivation component of being professional and taking training into my own hands has been empowering and organic in a way that makes coming to practice really exciting. How important do you think it is to take ownership of your swimming? I think it’s hugely important. Swimming has been a passion of mine since the beginning, and I’ve always done it for the fun of the sport and relationships made. I don’t think the commitments of being a competitive swimmer are worthwhile if the motivation is extrinsic, or if daily enjoyment isn’t there. Dave is a big advocate of his athletes taking ownership of their own swimming. He provides the tools for our success, but it’s up to us to take advantage of the opportunities that we are given. How do you handle the pressure of Olympic year? It sounds cheesy, but I’m just trying to enjoy the process and be my best self every day. I’m focusing on things that are in my control, which is pretty contrary to the nature of US Trials where your selection to the team is entirely based on ranking. I’ve found that little distractions – friend time, art projects, vacation planning, etc. – help me be myself day-to-day by keeping thoughts away from swimming 24/7. Perspective is important. What are your goals for Olympic Trials? I’ve been dreaming of the Olympics for as long as I can remember. My goal is to make the Olympic Team, but that’s not entirely in my control. I’ll be happy with a best time. Another goal of mine is to enjoy the meet! I don’t want it to be anxiety-filled and horribly scary – I swim because it’s fun and I love it. It’s important for me to keep it that way.